Prepare to be tracked inside Apple Stores. That is, if you opt to be and shop at one of the company's 254 US brick-and-mortar outlets. According to the AP, Apple has turned on iBeacon tracking at its retail locations. Users who agree to be tracked and receive alerts via the Apple Store app will be sent messages about products, events and other information, such as if an item they ordered is ready for pick-up. 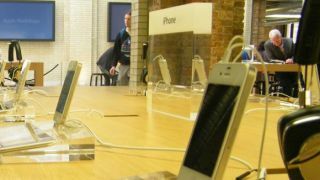 iBeacon alerts will only work on iOS 7 devices and if Bluetooth is enabled, so check those off if you don't mind Apple knowing you're inside one of its highly profitable retails spaces. The company said it doesn't keep information about users inside its stores, but it still may be eerie to receive perfectly timed alerts as you peruse the shelves. "How did it know I was thinking about an iPhone upgrade???" may become the phrase du jour before long. Our blips are not tracking your location. We promise.